"Sceptics, including many in the West, are understandably inclined to see a smokescreen, and to consider Putin directly or indirectly responsible for Nemtsov’s death," wrote Sir Andrew Wood, the British ambassador to Russia between 1995 and 2000, on the website of Chatham House, a London-based think tank. "To understand the implications of the killing for Putin’s political options, it is useful to consider two possible interpretations of events circulating among the cognoscenti. The first implicates Putin himself, implying either that the president ordered the assassination or that incautious words spoken in anger prompted others to take matters into their own hands," he wrote. "The regime has well-known links to quasi-legal groups like the newly established anti-Maidan organizations, whose mission is to break up opposition projects, by violence if necessary." The former ambassador also noted the possibility of what he called a "second scenario" in which "while Putin remains answerable for the assassination because of the Russia he and his cabal have brought into being, he did not in fact order it or want it." Mark Porubcansky, the former foreign editor of the Los Angeles Times, expressed a similar conclusion in an op-ed published by MinnPost, a non-profit journalism website. "Even if you’re inclined to accept that Putin wasn’t personally involved in Nemtsov’s death, it’s hard to escape the conclusion that someone, somewhere in the governing structure was," Porubcansky wrote. Porubcansky’s comments echoed remarks made after the arrests of the five Chechens by Zhanna Nemtsova, Nemtsov’s 30 year-old-daughter. Nemtsova told the BBC that Putin is "politically" responsible for her father’s murder, adding that the Russian opposition movement had been "beheaded" by the killing and that "everyone is frightened." Before the arrest, Lilia Shevtsova, a Russia specialist at the Brookings Institution, and David Kramer, the senior director for human rights and human freedom at the McCain Institute, wrote that Nemtsov’s death was a "crude and blatant political murder." As one of the most persistent and vocal critics of President Vladimir Putin, the 55-year old-Nemtsov, a former deputy prime minister, had been preparing to lead a protest march and to release a report containing information about Russia’s activities in Ukraine, Putin’s most controversial foreign policy adventure. 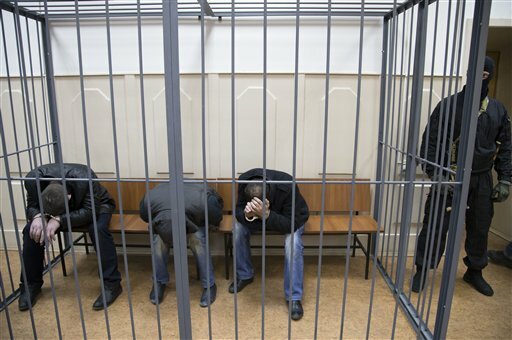 Authorities at Moscow’s Besmannyi Court announced on March 7 that Zaur Dadayev and Anzor Gubashev were being charged with "committing murder in a group for commercial gain," according to the Wall Street Journal. The alleged crime carries a potential life sentence. Russian authorities also announced that three other men, including Gubashev’s brother, Shagid, a truck driver, had been arrested on similar charges. The arrests came on the heels of large protests in Moscow and St. Petersburg over Nemtsov’s murder, as well as a chorus of criticism from various foreign governments. The five suspects hail from the Chechen region of southern Russia, a traditional hotbed of Muslim opposition to Kremlin rule. In recent years that opposition has been tamped down by a campaign of suppression led by Ramzan Kadyrov, a Kremlin favorite who had branded Nemtsov "disloyal" after the opposition leader criticized Putin’s annexation of Crimea. The arrests were said to have been the result of eyewitness accounts and forensic evidence. The Moscow judge overseeing the case claimed that Dudayev had confessed, but during a brief court appearance broadcast on Russian television, Dudayev neither confirmed nor denied his involvement. The other arrested suspects proclaimed their innocence while law enforcement authorities offered no motives for the murder or any insight into who might have ordered the murder. There is heightened official sensitivity to the international fallout focusing almost exclusively on possible Kremlin complicity. Shortly after Nemtsov’s death, Putin denounced the murder, saying that it was unwarranted and a provocation in which the perpetrators were seeking to discredit the Kremlin, according to Reuters. Other Russian commentators asserted that Nemtsov was murdered by those in Chechnya’s Muslim community because of his support of the journalists killed in Paris in January by Islamic jihadists at the office of the satirical magazine Charlie Hebdo. Chechen gunmen were also implicated in the death of Anna Polikovskaya, a journalist and critic of both Putin and Kadyrov. This entry was posted in National Security and tagged Chechnya, Crimea, Russia, Vladimir Putin. Bookmark the permalink.